The best part about exams is, well, when it's finally ended (obviously). Not that it has ended for me – yet. As of today, I still have two papers left, two excruciating papers that I have to go through. But, when it all ends, the burden relieved off of your shoulder is visibly felt; you can feel that huge amount of pressure you’ve been lugging around start to lighten and limbs start loosening, that rush of relief that I wouldn’t mind experiencing over and over again, even though I have to go through exams after exams after - okay seriously, maybe not. I apologize that my blabbering has nothing to do whatsoever with today’s post, but I just needed to get that out of my system. Klaxons' music fuses elements of electronic, disco, indie and punk –it’s called ‘Nu Rave’ people! However, ‘Nu Rave’ - according to the band themselves - turned out to be a joke. Well, joke or no joke the name-label stayed on like super-glue and whatever or however they do it, they must be doing something right, because they keep producing hit after hit. I seem to have taken a fancy towards this particular number, albeit it only being a cover of 1990s dance music act, Grace’s, ‘Not Over Yet’. 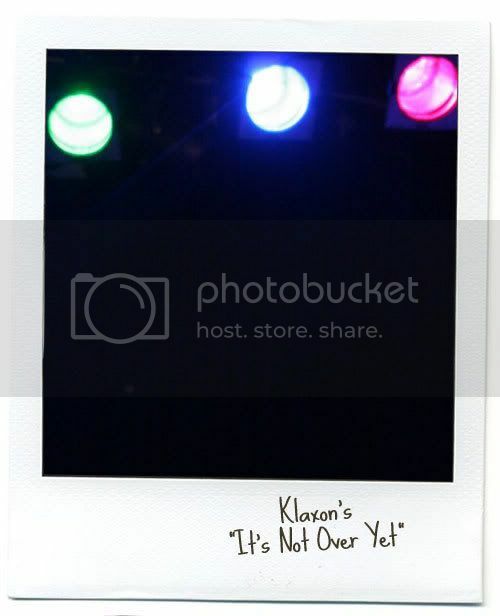 Klaxons are pretty famous for the weird cover choices they come out with, but this one is by far the best from the band. Overall, it sounds like an improved version of the original, with the visibly heavy abrasive sounds – it kind of reminds me of gleaming spotlights and people in fluorescent outfits and kitschy clothes self-parodying around, then again isn’t that what ‘Nu Rave’ is really all about?